Budding North Carolina artist Beth Feeback dropped by a local Goodwill store recently and stumbled upon a pair of large paintings for $10 each, which she intended to cover with primer and use as blank canvases, but luckily for her, she did not follow through with her plan. Feeback, 45, of Concord, discovered to her surprise that one of the artworks that she snapped up for a song is called Vertical Diamond by notable 20th century artist Ilya Bolotowsky, which has been valued at between $15,000 and $20,000 by the renowned auction house Sotheby’s. The 45-year-old artist came across the paintings on April 28 when she and her husband, Steve, 35, were on their way to display their own funky, vibrant canvases at an art fair in Oak Ridge, ABC News has reported. The day was chilly and Feeback, who suffers from rheumatoid arthritis, had not dressed warmly enough. She remembered having passed a Goodwill store on the way to the fair, so she decided to make a dash there and pick up a blanket or afghan. 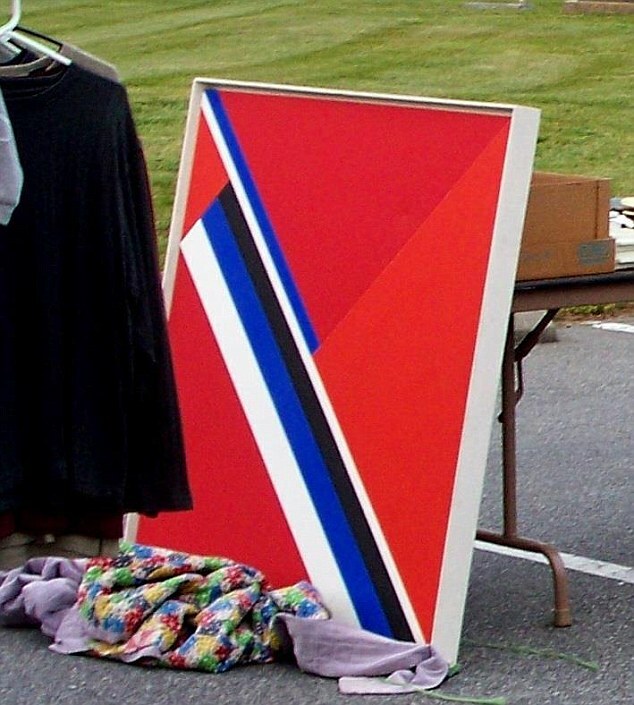 After buying a throw and a pair of gloves, Feeback spotted two large red, white and blue paintings. Aesthetically, the 45-year-old artist, who specializes in whimsical animal iconography, was not drawn to the artworks, which to her appeared to possess a musty 1970s quality. ‘I thought they would be awesome canvases. They were $9.99 a piece and I just thought they would be great to just draw on them and paint over them because I didn’t like them as paintings,’ Feeback recalled. ‘The Weatherspoon gets some big-name artists,’ Mrs Feeback recalled Pizio saying, according to the Charlotte Observer. Convinced that she should research the paintings before slathering their surface with primer, Feeback put them away in her art studio, where they collected dust until mid-June. More than once during that time Feeback considered painting over the artworks, but something stopped her. Finally, the Concord resident powered up the Google search engine, and the first result that came up led to a Wikipedia page dedicated to the artist Ilya Bolotowsky. Bolotowsky was a prominent abstract painter who fled his native Russia as a teenager and settled in Brooklyn, New York, in 1923. 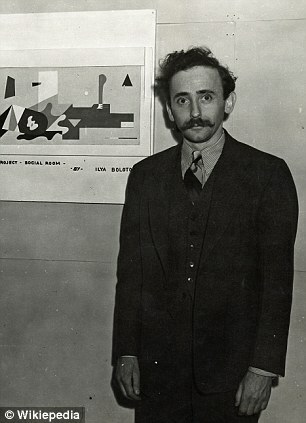 He died in 1981 at age 74, living behind a significant body of work in geometric abstraction and cubism. ‘I was like, ‘Holy crap, I better get those up off the floor over there,’’ Feeback said, referring to the pair of paintings. On the advice of friends, Feeback contacted Sotheby’s in New York, sending photos of the painting and the labels on the front and back. Experts at the auction house broke the news that Feeback had stumbled upon a small treasure, and asked her to send them the painting. Meanwhile, a Facebook friend contacted a curator at the Weatherspoon Gallery, who provided Beth with documents of the artwork from the 1979 Collectors Show. Those documents revealed that a now-defunct textile company had owned both paintings. When the manufacturer went bust, a married couple had bought the canvasses at a liquidation sale to decorate their basement, but the room turned out to be too small. They tried to sell them at a church yard sale on April 28, but when no one jumped on the offer, they took them to the Goodwill store, which specializes in second-hand items sold at reduced costs. As luck would have it, Feeback showed up at that store that same afternoon and found them. The 45-year-old Concord painter said she contacted the couple who used to own the Bolotowsky work and told them about its true worth. 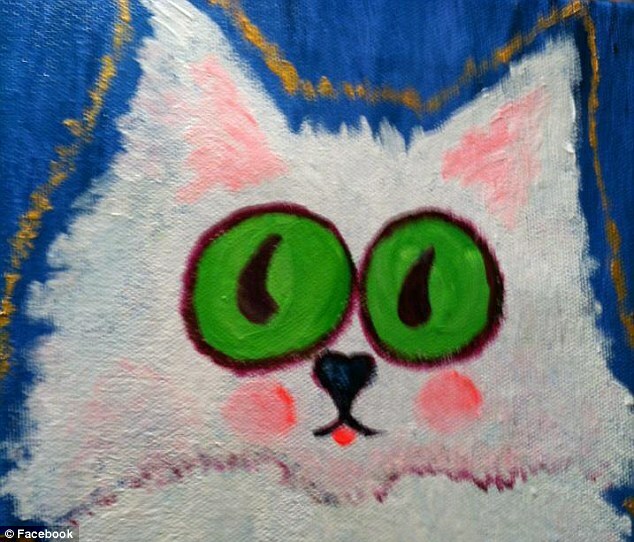 Rather than ask for a share of the artwork’s value, its previous owners accepted Feeback’s offer to paint them a portrait of their late cat, Buttons. Sotheby’s will auction off the painting on September 21, but it could potentially get delayed until March. Feeback said she plans to use the money to pay her mounting credit card bills, and whatever is left she plans to invest in a tricycle since owning one has always been a dream of hers. The venerable Players Club may soon have to part ways with one of its oldest members. John Singer Sargent’s painting of the 19th-century actor Joseph Jefferson has quietly gone on the auction block, much to the dismay of several members. The Players has owned the painting for more than 100 years. John Martello, the executive director, said the club needs about $2 million to repair its crumbling facade on Gramercy Park. Earlier this year, the club sold off another Sargent, this one of the actor Lawrence Barrett. The Barrett, he said, went for just over $1 million to an anonymous buyer, who’s agreed to lend the painting to the club for special events. The Jefferson is also expected to fetch over $1 million. Sargent’s most sought-after paintings — of Edwardian-era society figures — have sold for $10 million to $15 million on the rare occasions they come up for auction. The Players was founded by actor Edwin Booth, the brother of John Wilkes Booth, the man who assassinated President Lincoln. The 1845 building, in fact, was Booth’s townhouse. Booth converted it into a club for actors, writers and artists in 1888. His friend Stanford White did the renovations. Mark Twain was one of its first members, and his pool cue hangs in the Grill Room. The elegant townhouse is one of the city’s 19th-century jewels, but for more than a year its facade has been covered by scaffolding and netting. Like many private clubs during the recession, The Players has been struggling as membership plunges. Last year, it lost nearly $500,000. In 2000, The Players parted with yet another Sargent — a head-to-toe portrait of Booth, which had pride of place in the living room. Gallery owner Warren Adelson bought it for $2.5 million. The club was forced to sell the painting as part of a deal with the New York attorney general to settle a complicated tax matter from the 1980s. A reproduction of the Booth painting hangs in the club, and Martello says copies are being made of the Barrett and Jefferson as well. It’s a striking portrait, notable for Jefferson’s penetrating eyes and his white tornado of a hairdo. If I had a million dollars lying around, I’d snap it up in a minute. A great pal of Booth and Sargent, Jefferson was famous for his Rip Van Winkle, a part he toured in for nearly 50 years, from America to Tasmania. He was the Carol Channing of his day, Channing having toured as Dolly Levi in “Hello, Dolly!” for most of her career. The Players still has some important paintings — a Gilbert Stuart, an Oliver Ingraham Lay and a Gainsborough, though the authenticity of the Gainsborough has never been established. There is a glimmer of hope for poor old Joe Jefferson, a founding member of the club and one who, I’m sure, won’t be happy to leave. Martello is trying to put together a consortium of Players Club members to buy the painting and then donate it to the club’s nonprofit foundation. So far, he hasn’t made much headway. And that facade is crumbling. Speaking of crumbling, that’s what happened to the box office at the Lunt-Fontanne, where “Ghost” is running — well, stumbling is a more accurate description. The show took in just $600,000 last week, and yesterday the producers announced it will close Aug. 18. The total loss is thought to be a scary $15 million. A lot of big theaters are going to be empty in the coming months — the Lunt, the Broadway, the Richard Rodgers, the St. James (“Bring It On” is a limited run). Are Broadway’s salad days coming to an end? LONDON, July 24 (Xinhua) -- Beijing Guozijian Oil Painting Art Museum started its 2012 Chinese Oil Painting Art Exhibition in London on Tuesday. The exhibition at Olympia West Hall will play a central role within the "Colourful Beijing" Culture Week celebrations, taking place July 24-31, and will be part of a wider initiative by the 2008 Olympic host city to celebrate the London 2012 Olympic Games. Vice President of the Chinese Academy of Oil Painting, Zhang Zuying says: "We are grateful to the Greater London Authority. Thanks to its invitation we have won this precious opportunity to show in the host city of the Olympic Games oil paintings featuring Chinese aesthetic values." For the first time in Britain, the exhibition will unveil 100 oil painting masterpieces by Chinese artists, marking 500 years of cross-cultural exchange in ideas between China and Europe. As the largest exhibition to date of its kind, over 60 artists have been selected for the event, representing China's most prestigious oil painters. Displayed chronologically, audiences will gain an insight into the unique and evolutionary story of cross-cultural dialogue in the modern Chinese art world, where the expressive forces of Western art blend with the national aesthetic concepts of Chinese modern culture. "The 20th century witnessed the emergence of Chinese artists on to the world stage, with many of them introducing Western style oil painting to China and incorporating both foreign and Chinese techniques and style. The interaction and integration of different cultures in the development of the Chinese oil painting result in art which develops in many directions. The plethora of ideas and a great diversity of styles and schools show the self-exploration and personal creations of Chinese artists," says Jin Shangyi, Curator of the Museum. All the works displayed in the 2012 Chinese Oil Painting Art Exhibition will go on to be housed in the Beijing Guozijian Oil Painting Art Museum, scheduled to open to the public in 2013. The current exhibition is well supported by city governments in Beijing and London. The two sides have vowed to boost bilateral exchanges in the creative industry.